My children have grown up eating brodo with pastina with a good sprinkling of Parmesan cheese. 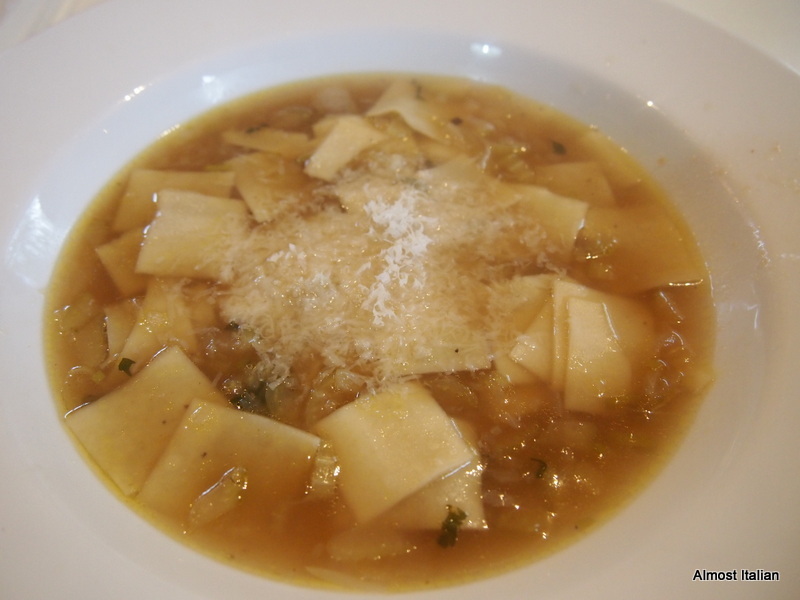 They were introduced to this easy lunch by their Nonno and Nonna as toddlers and have loved it ever since so we always have chicken stock and pasta on hand. Ah, such a lovely comment Mary. Food memories are so ingrained in our consciousness. 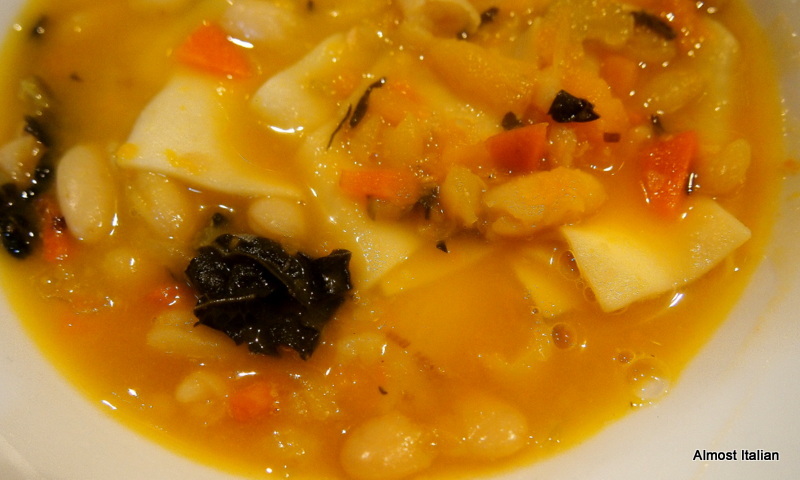 Your children must be reminded of their Nonni every time they have Pastina in Brodo. It’s true, food memories are ingrained in our consciousness. I remember watching my grandmother make her delicious vegetable soup. She would send us to the corner store to get 25 cents worth of shin bone for the broth!! I love soups too, and you have inspired me as to the fate of the pumpkin in my fridge! Restorative and informative, a lovely post. Thank you Francesca. Thanks Ardy. I think your slow cooker might be perfect to make things with bones ( I am thinking of Celia’s latest post here). My mother and grandmother also made soups like your grandmother did- usually they used lamb shanks. Now my mother, who is 92, makes it every week for her great grand daughter who visits each week. Little Samardi ( 15 months old) will have very strong food memories- the Nanna soups live on and on. 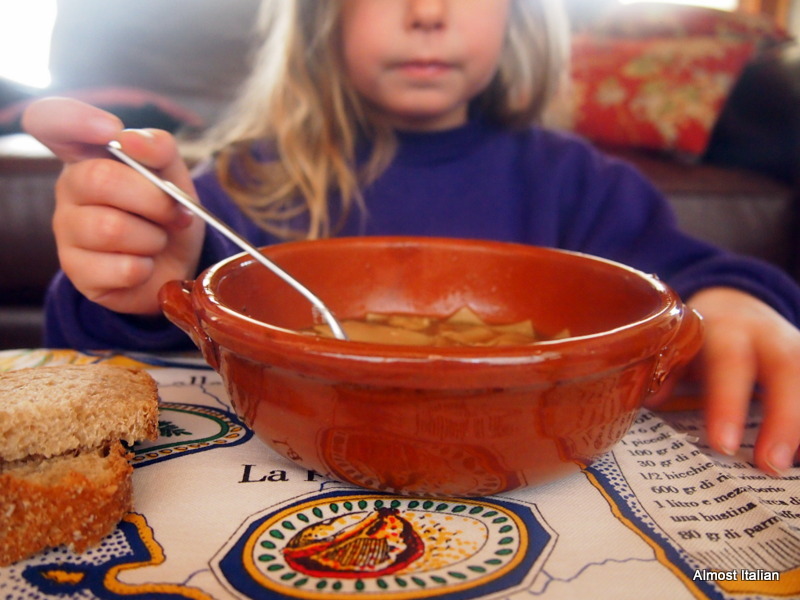 The veggo version of that old soup with lots of barley is the one I make for young Noah. We transfer a lot of culture, as well as love, through soup. Love those Italian sayings, especially the old hen. Soups are definitely comforting. I make them in every season. Really love the vegetable broth you made initially for the onion soup. I bet it was also wonderful with pasta and a sprinkling of cheese. Mr T is rather partial to the old hen saying, he said with a twinkle in his eye, which led to a response about old roosters and their tricks. Lovely, I could live on soup and bread and these look beautiful. All so hearty, I don’t think I would have a favourite.Thanks for the retrospective, will have to spend some time there I think. I want a nonna like Mary’s children have! Me too, we all want Mary’s Nonna. Pastina is a regular in the Napoli household. Its quick after work, delicious, incredibly cost effective, and filling. I will also throw in a handful of peas or some baby spinach or some cubed zucchini at the end. Sometimes I’ll also beat an egg through it. It is also what every Italian nonna and mamma feeds babies once they are on solids, using stelline. 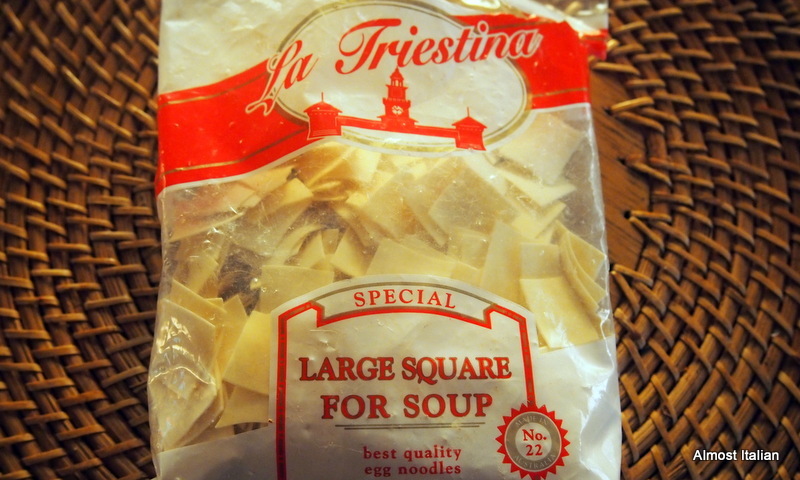 Love those square pasta shapes, must keep an eye out. The square Australian egg pasta shapes ones are lovely. My dear friend Olga taught me about using Pastina for little ones in her autobiography, ‘Piccola Quercia’. When she was at the migrant camp in Bonegilla in the 50s, she searched for these little shapes to feed her babies as the food was so unsuitable in the camp. She was also from Naples. I miss her, my Italian mentor. I love soup but it’s only in the last couple of years that I eat it for a meal. In Chinese meals it’s part of a series of dishes so it’s rarely the whole meal (unless there are loads of noodles in it of course). 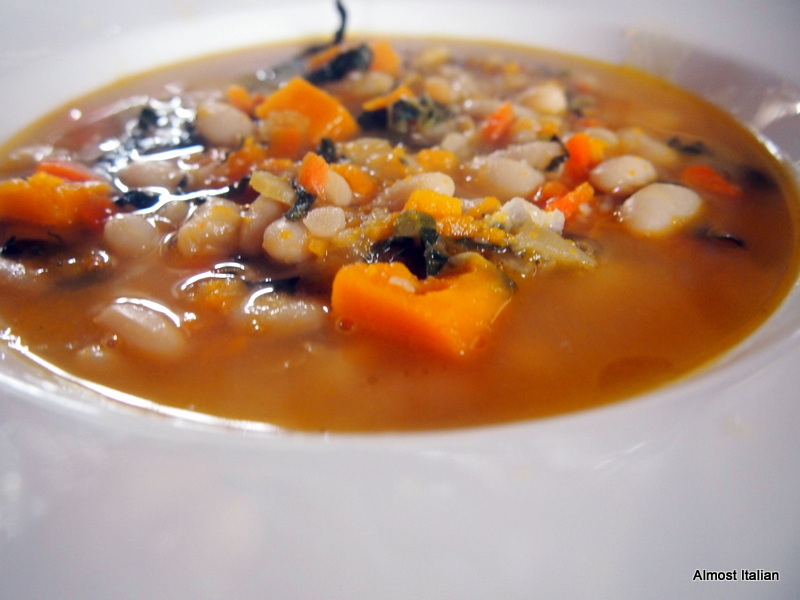 But soups like this are perfect for a whole meal! Love the pre portioned pasta squares. I could never quite manage the bowl of soup at then end of a Chinese meal when there last year. Soup and a hunk of bread- what more do you need! This soup addict adores this post and ponderings. I am gearing up to try making your roasted veggie stock this week. There is nothing more restorative than a good bowl of soup. Impossible on my work days but the way to go on any other winter day. Hope the stock goes well. Your veggo Yak should go for it. Yes, a big hug and a bowl of nostalgia. My Italian wwoofer, who lives on a rice farm near Pavia in Italy, is quite fond of frogs in …. risotto!!! They have lots of frogs there, given the flooding of rice, so I guess they are a traditional thing. I still have vege stock and French onion soup on my mind, and a thick roast pumpkin & vege soup variation mentioned in a comment about my pumpkin soup… and now this. I love light flavoursome broths with just a bit of something in them, and often find a simple cup of miso convenient and restorative. Old fashioned ham hock and pea soup is my family soup memory, that pungent aroma summons up the past! I love ham hock and pea soup… I am a wicked vegetarian. If you made me some, I would eat the whole pot. Reminds me of my Nanny. Previous Previous post: Vivid Birds of Healesville.